The Walt Disney Company now owns the rights to the iconic Star Wars franchise. Last year, Disney released The Force Awakens. 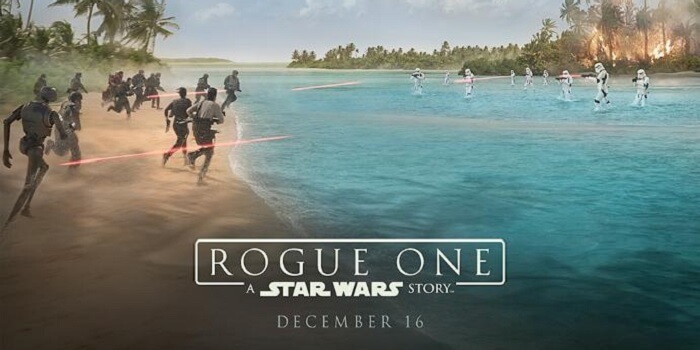 This year, it was Rogue One. They are building a Star Wars Land at Walt Disney World and Disneyland. 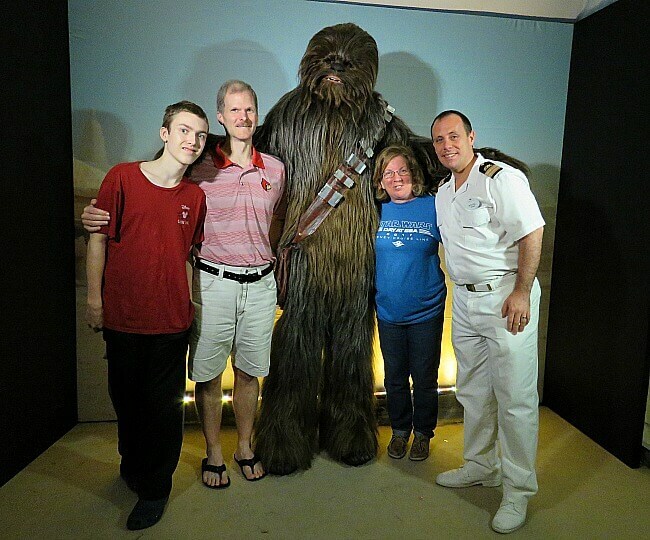 Disney Cruise Line now offers a series of cruises to the Eastern Caribbean featuring a Star Wars Day at Sea. 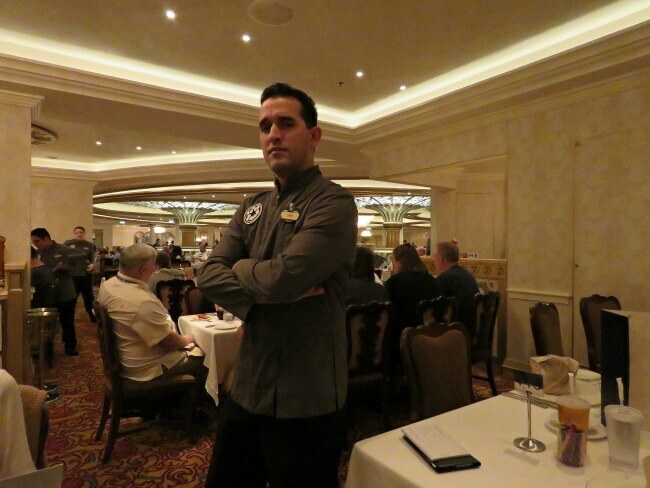 What Makes a Stars Wars Day at Sea Cruise Different? Disney Cruises always feature first run Disney movies playing continuously in the Buena Vista Theater including Disney animated movies, Pixar movies, Marvel films, Disney live action films, and Disney nature films. 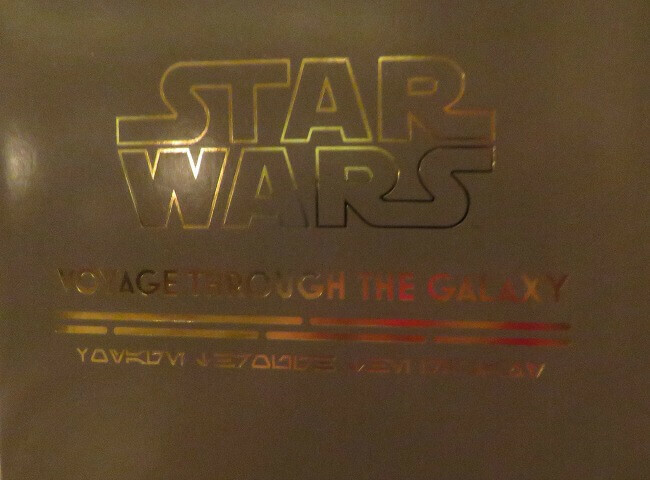 During Star Wars cruises, several of these are replaced with the 7 previous Star Wars movies. 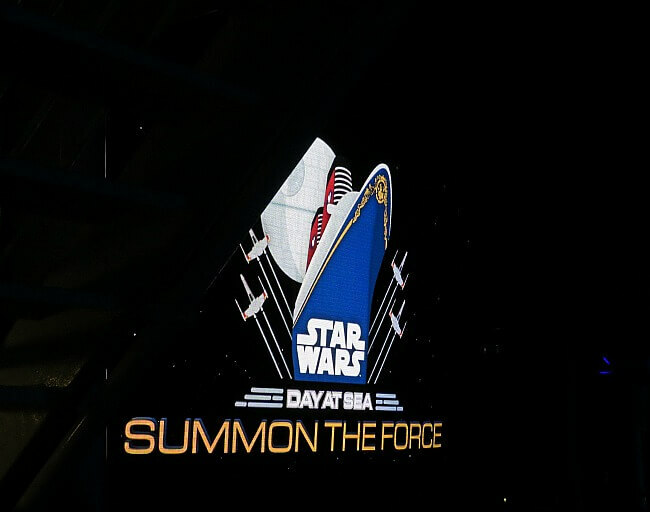 During the actual Star Wars Day at Sea, the whole ship is transformed. Normally on Disney cruises, classic Disney tunes play throughout the ship. On Star Wars Day, these beautiful, happy, light hearted tunes are replaced with music from the Star Wars movies. The mood is rather oppressive and dark. 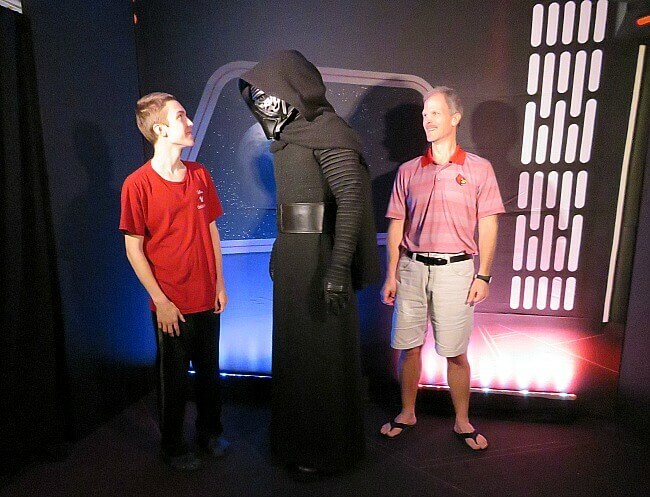 Character meet and greets are a common daily occurrence on Disney Cruises. The selection is vast, from Stitch to Disney princesses to Captain Hook to Sully and Boo. 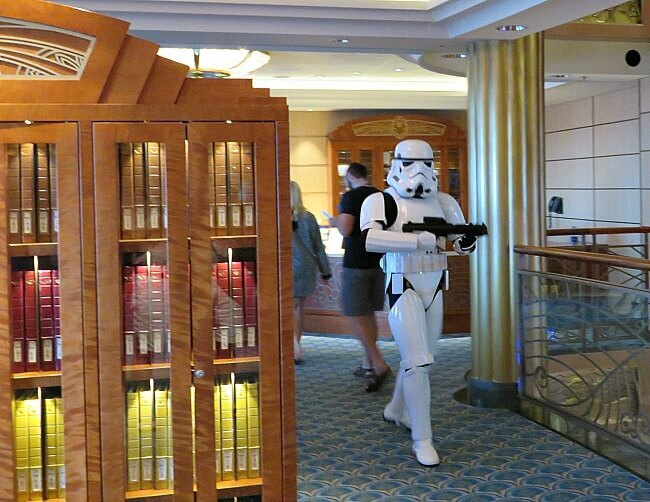 On Star Wars Day at Sea, Storm Troopers roam the halls and the decks, questioning passengers as they go. Sand people and other creatures pop up here and there. 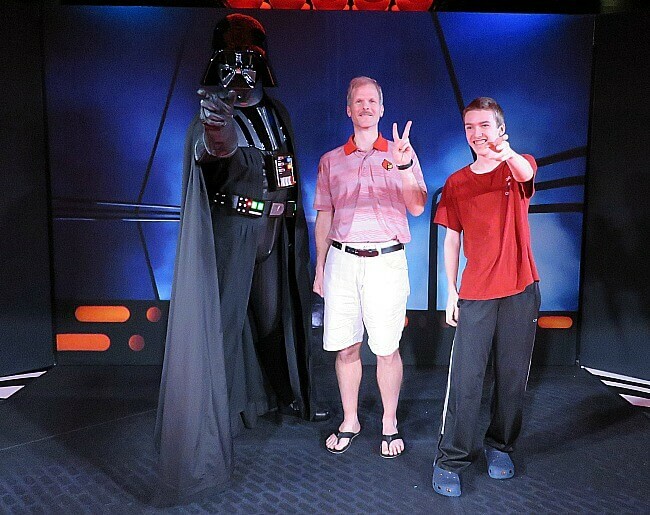 Official meet and greets are held with some of iconic Star Wars characters. 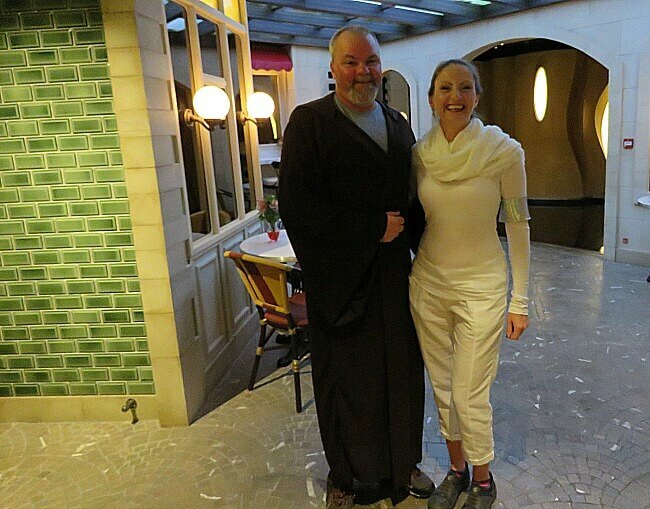 People of all ages dress as their favorite Star Wars character. Toddlers to seniors and all ages in between walk around as Jedi knights, Sith Lords, droids; the entire Star Wars universe is on parade. I was shocked at the level of participation. The best costume competitions were not just for the kids. 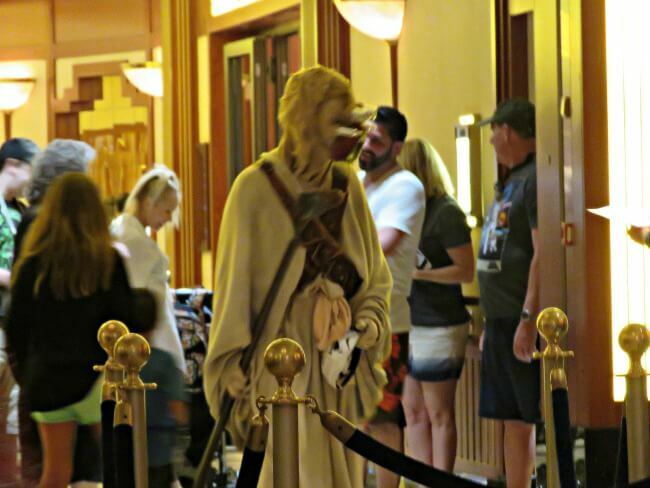 As many adults were decked out as their favorite character as were children. There are Star Wars themed quizzes and crafts. The menu has a Star Wars theme. Instead of a musical or comedian or magician, on Star Wars night we were treated to a 3D showing Rogue One: A Star Wars Story on the huge screen in the Walt Disney Theater. The movie had been out for 3 – 4 weeks and was still a top 5 grossing film when we saw it. All Disney cruises have a pirate night with a stage show and fireworks on the upper deck. On Disney Star Wars Day at Sea cruises, you get a second stage show with fireworks; this time with a Star Wars theme. That all depends on how big of a Star Wars fan you are. I spoke with several people who are self-described Star Wars geeks who had a ball and said that they will definitely repeat this cruise. For those of us who are not huge fans, it was okay. It was really cool speaking with Darth Vader and Chewbacca, and seeing storm troopers patrol the halls. After a while though, the music became oppressive and the magic wore off. I would also have preferred a better variety of movies during the cruise. It was neat, but we won’t do it again. If you are big Star Wars fan, then you will love it. For the rest of us, a regular Disney cruise is a better option.